Dubai – Leading global professional services firm Alvarez & Marsal (A&M) today released its latest UAE Banking Pulse for Q4 2018. 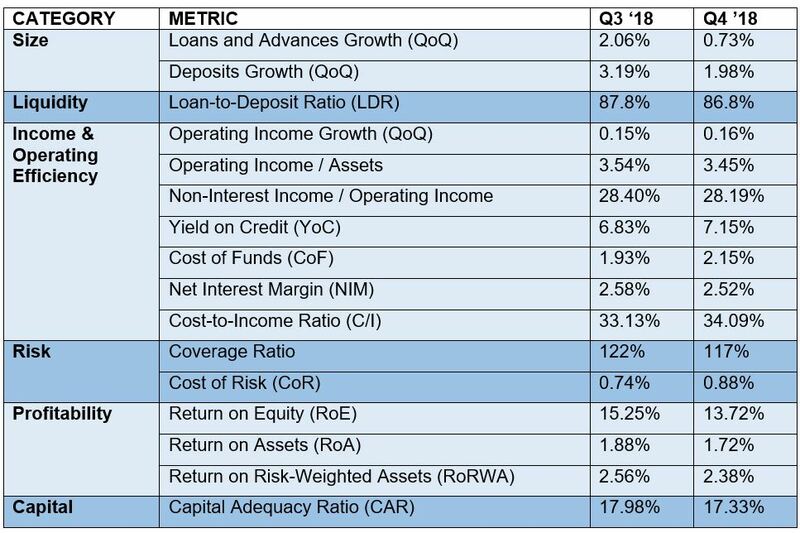 Overall the data highlights slower growth in deposits, loans and advances than in Q3 2018, resulting in a marginal decrease in the loan-to-deposit (LDR) quarter-on-quarter. The interest income continued an upward trend on a year-on-year basis, with a 0.6 percent increase this quarter. Alvarez & Marsal’s UAE Banking Pulse compares the data of the 10 largest listed banks in the UAE, looking at the fourth quarter of 2018 (Q4 2018) against the previous quarter (Q3 2018). Alvarez & Marsal’s report uses independently-sourced published market data and 16 different metrics to assess the banks’ key performance areas, including size, liquidity, income, operating efficiency, risk, profitability and capital. The country’s 10 largest listed banks analyzed in A&M’s UAE Banking Pulse are First Abu Dhabi Bank (FAB), Emirates NBD (ENBD), Abu Dhabi Commercial Bank (ADCB), Dubai Islamic Bank (DIB), Mashreq Bank (Mashreq), Abu Dhabi Islamic Bank (ADIB), Union National Bank (UNB), Commercial Bank of Dubai (CBD), National Bank of Ras Al-Khaimah (RAK) and the National Bank of Fujairah (NBF). A&M Managing Director and Middle East Office Co-Head in the firm’s Strategic Performance Improvement Practice, Dr. Saeeda Jaffar, was the lead author of the report. It was co-authored by A&M Head of Financial Services Asad Ahmed, along with Neil Hayward, Managing Director and Middle East Co-Head, who specializes in turnaround and restructuring.